Need some convincing on the benefits of attending? 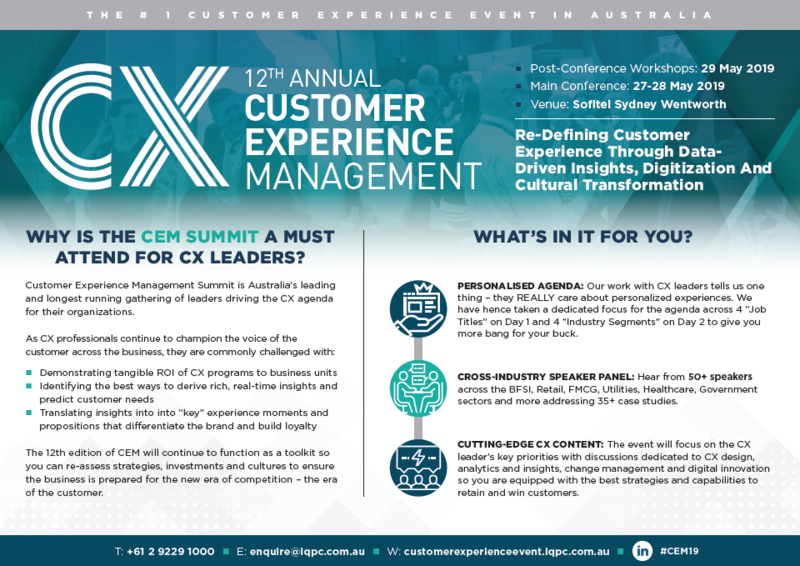 The 12th Annual Customer Experience Management Summit is Australia’s leading and longest running gathering of leaders driving the CX agenda for their organisations. Download the business case now for a snippet of what you can expect in 2019. Ahead of the Customer Experience Management Summit 2019 we chat to Emma Brady, Customer Experience Manager at Cosmetic company, LUSH. Emma shares how LUSH has created superior customer experiences through a focus on shared passions and engaged employees. Forrester has predicted that by 2020 CX will overtake price and product as the key brand differentiator. Satisfying the customer is no longer enough. Regardless of your industry your customer experience is now being compared to those provided by the likes of Uber, Amazon and Netflix. How is this going to impact the way organisations operate in the CX space? What other factors are influencing the way organisations approach CX? In the CEM Talks video series Charles Weiser, Chief Experience Officer at Optus and Peter Merrett Founder of the House of Wonderful explore in-depth. Driving a transformation in all customer behaviours is digital disruption and innovation that is pushing customers online. This is felt especially in the financial services sector where footfall in bricks and mortar branches is steadily decreasing and the desire for omni-channel 24/7 experiences, increasing. Customers' digital behaviors can initially seem haphazard and hard to decode. Despite the complexity of defining digital experience, brands must master this exercise if they are to delight customers and win loyalty. To learn how your brand can define and evolve your customers digital experience download this exclusive report based on data from over 200 marketing and CX professionals from some of the world’s leading brands. The report provides unique insight into the strategy shaping digital experience. Ahead of the Customer Experience Management Summit 2019 we share with you insights from our USA sister event. CEM USA have have conducted extensive market research to help you make better decisions when developing your customer strategy, with the aim of delivering a great experience with the profits to match.